Beautiful tourist resort: Costa Teguise holidays are a great example of a man-made development. To cope with the ever increasing popularity of holidays to Lanzarote in the 1970s, this resort was purposely built with bright street lights and accessible roads. However, in keeping with the lovely natural surroundings, the building and hotels on Costa Teguise holidays have managed to retain a village feel and calming atmosphere for relaxing holidays. Beach holidays: There are three fabulous beaches all within easy reach of Costa Teguise holidays. The main beach is right in the resort, a 600m stretch of golden sand named Las Cucharas. Or if you fancy being surrounded by pristine white sand instead, head to Los Charcos or Playa Bastian. If you require more information about resorts in Lanzarote just click "Lanzarote Holidays" to visit our dedicated holiday guide. Golf Costa Teguise: Just a little inland, less than a mile away from the centre of Costa Teguise, you’ll find this excellent 18-hole golf course. Designed in 1978, the course has over 3,500 palm trees and challenging features such as dog legs and narrow fairways. It’s in a stunning setting too, the terracotta coloured volcanic sand and rocky mountains creating an unusual backdrop to your game. This course is a great choice for golfing holidays in Lanzarote. Aquapark Costa Teguise: A well-equipped water park with slides that’ll suit all ages. The super-fast Kamikaze is one for the thrill-seekers, while there’s also a children’s zone for youngsters on family holidays. Water sports: Las Cucharas Beach is a real favourite for windsurfing holidays, as the strong winds out to sea make conditions perfect. Each beach on Costa Teguise holidays is well supported with all other kinds of water sports too, such as scuba diving, jet skiing and parasailing. 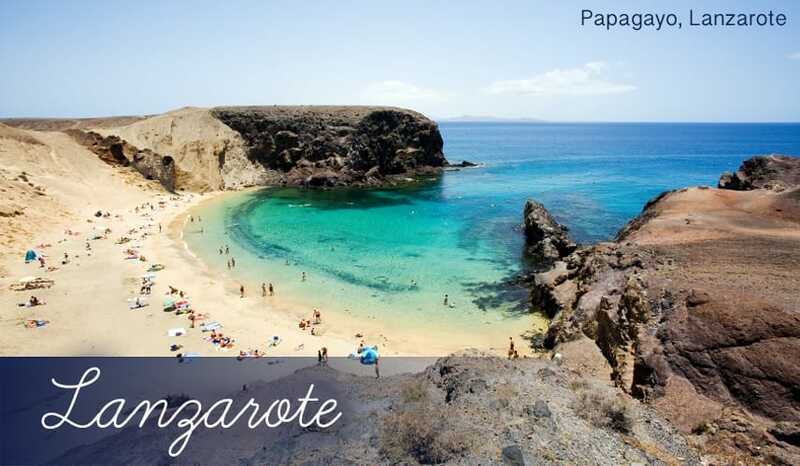 Playa de las Cucharus: This naturally curving beach of fine golden sand is the most popular in Costa Teguise. The waters are calm and clear, although this particular stretch of coast is a focal point for windsurfing holidays, as further out to sea the wind whips up the ideal conditions. Playa Bastian: At around 400m long, Playa Bastian beach is a little shorter and smaller than Las Cucharus. It’s got lovely white sand though, and the rocky headlands keep the water pleasantly calm. Playa de los Charcos: A small quiet beach which also forms a curving bay. It’s another beach that’s popular for windsurfing holidays. You could also join in with the volleyball games held there regularly! Playa El Jablillo: A very quiet cove in an idyllic setting. It’s only 150m long but worth a visit on holidays to Costa Teguise if just to appreciate the fine white sand and shimmering turquoise water. The long headland with hotels built across it also helps calm the strong winds which Costa Teguise holidays often experience. El Navarro: This restaurant is very highly regarded for its innovative menu and creatively presented dishes. Give the Goat Cheese Salad a try, the strong taste of the cheese mixes with the sweet Spanish Tomatoes beautifully. The steaks here are also something of a speciality; they’re served with interesting sauces such as blue cheese and blackberries or caramelised Dijon mustard. Clockhouse Tavern: The perfect place for home comforts on holidays to Costa Teguise. This friendly, informal bistro serves a variety of cooked breakfasts including the famous English Cooked Breakfast and American-style Pancakes and Maple Syrup. Be sure to book a table for the pie nights too, which offers home-made Steak and Chicken Pies. Repikada: Surprisingly, there aren’t many authentic Spanish restaurants in Costa Teguise, most of the cuisine offered in the resort is dominated by British, Chinese and German dishes. Luckily, Repikada will give you a true taste of Spanish food. The extensive tapas menu includes favourites like Chorizo and Fried Squid, and the Canary Islands signature dish of wrinkled potatoes is available too. Bars and restaurants: There’s a great selection of restaurants on Costa Teguise holidays, and many of them also double up as lively bars when the sun goes down. Most of the main bars and clubs tend to be grouped together in certain places, specifically Avenida del Mar, Calle las Olas and Avenida de las Islas Canarias. There are some nice British pubs in the resort too like Red Lion, The Inn Place and Cutty Sark. And if you fancy staying out even later, there’s always the Coyote Disco Club, which stays open till the early hours with live DJs. Shopping Centres: As with the rest of the Canaries, shopping on Lanzarote holidays is duty and tax free, so you should be able to find many bargain holidays there. Because prices are nice and low, shopping is a very popular pastime on holidays in Costa Teguise, hence the large number of malls and commercial centres. The largest is Las Cucharas Comercial, but there are many others including Puerto Tahiche, Toca Centrum, Santa Rosa and El Trebol. Expect to find great value electrical items, alcohol and fragrances. Teguise Market: Travel around 4km inland and you’ll reach Teguise, the old capital of Lanzarote. There’s a brilliant market here every Sunday with hundreds of stalls selling clothes, leather items, ceramics, artwork and local produce. If you’re feeling peckish after browsing the bargains, there are plenty of options for tasty fast food from the street traders. Live bands often play in the centre of town to add to the carnival atmosphere.